Hello once again. This is Edition 17 of my ramblings, though unfortunately I've not rambled as much as I had planned or would have liked during the last week or so, mainly due to the poor weather. Last Friday I had to head down to Birmingham with work so decided to make a day of it. 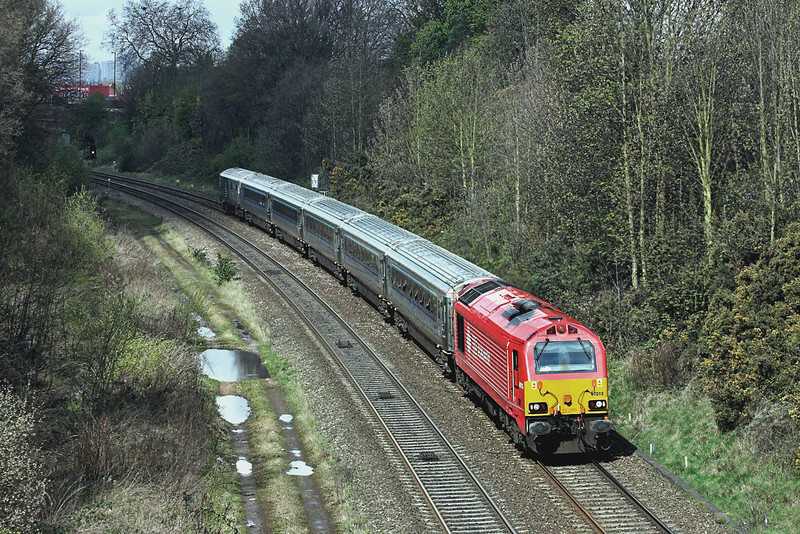 The first thing I did do was go for a shot of the DB-red liveried 67 that was working the all day Chiltern diagram. I found a good bridge near Acocks Green just north of the station. Carrying a footpath it gives a good view both directions and, more importantly, the angle of the line is just right at 1100 for the sun. Amazingly, like the day before near Warrington on what turned out again to be a mainly dull day, the sun just stayed out long enough for the shot I wanted. 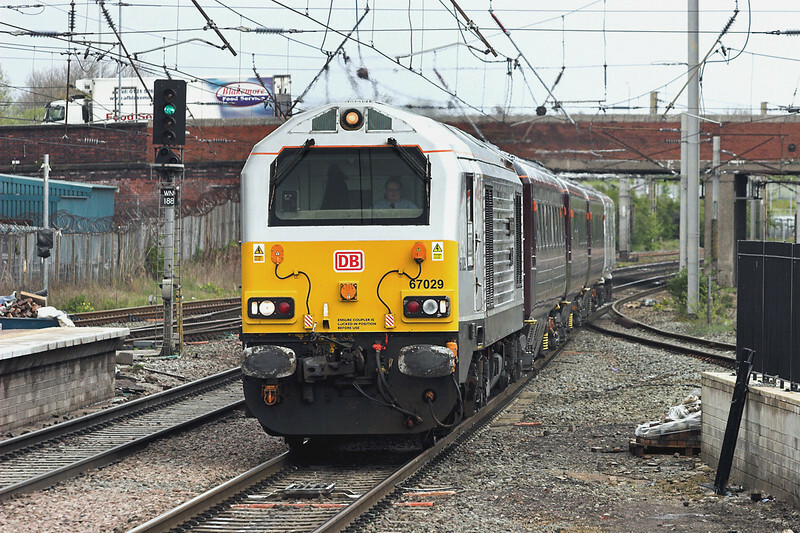 Currently there are loco hauled departures from Birmingham Moor Street to London Marylebone scheduled at 0619, 0655, 1055 and 1555 with the return northbound services at 0837, 1337, 1646 and 1807. 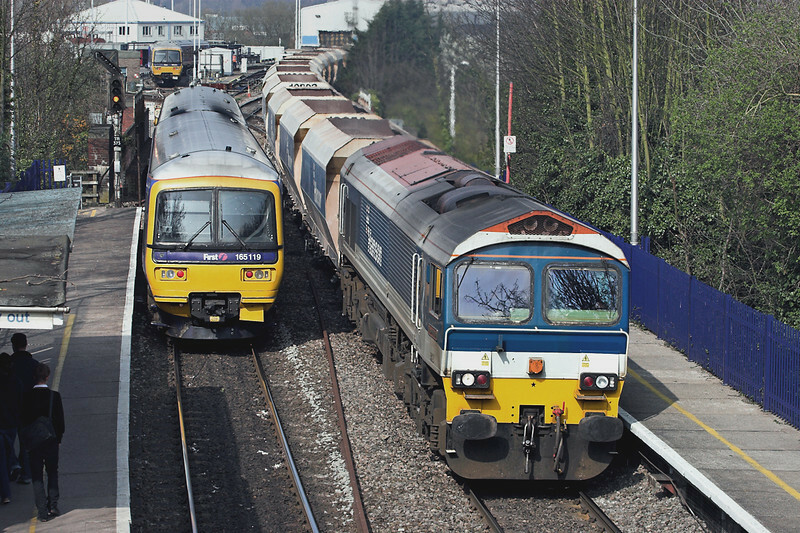 There is also an additional peak hour train, one each way, between Banbury and London. After a bit of time doing work things, which precluded me getting a shot of the Colas Rail operated class 56 on a Cardiff to Derby train (annoyingly double headed it transpired), I ended the day along the Midland Metro route. 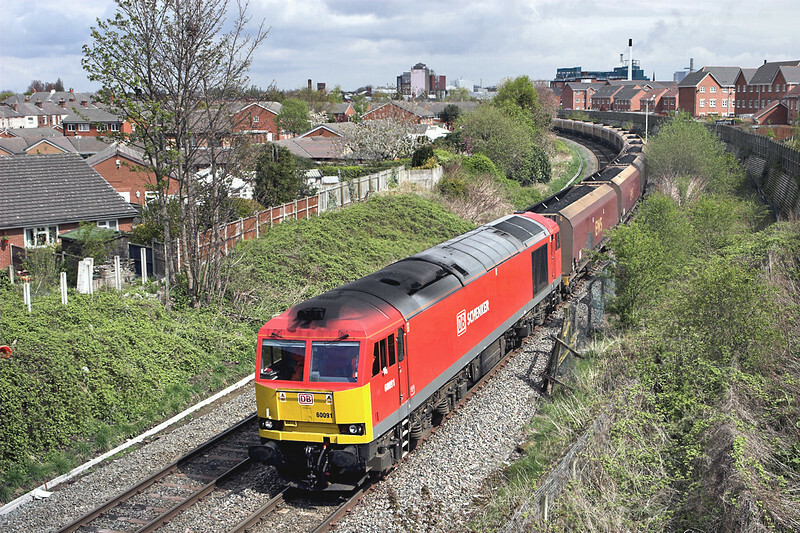 For those that don't know, this line basically follows the former Great Western route from Birmingham Snow Hill to the outskirts of Wolverhampton, and is interesting from the point of view of its obvious pedigree in the bridges and tunnels it passes under. An extension via the streets at Birmingham is planned, as is a new fleet of larger trams. This latter thing would appear to be certainly needed as the original Ansaldo built 2-car vehicles feel very small inside. 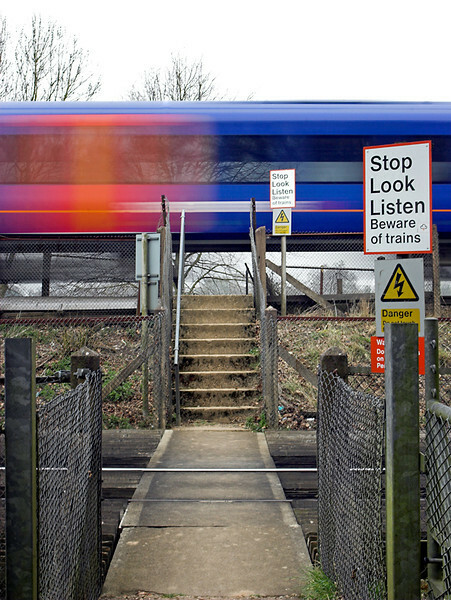 The line operates on a nominal 8 minute frequency, though up to every 6 minutes at peak times. With a fleet of 16 trams it would appear no more than 14 are ever needed as the two original trams numbers 01 and 02 are parked outside the Wednesbury Depot, and judging by the bits missing off them they have been used to supply bits to keep other trams running for some time! Well, my great plans of at least one long distance trip this week were thwarted in the end for various reasons, so the only pictures I have taken were when I discovered the 'Great Britain V' was due to leave Preston. 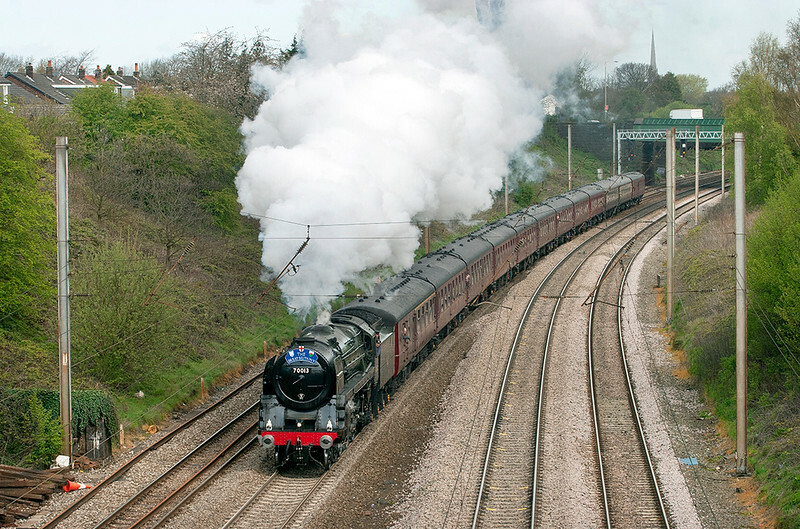 I don't normally make the effort to go after steam hauled trains as they are well covered by everyone else, but as this marathon 9 day long tour would be passing within 5 minutes drive of my house I made the effort. Unfortunately I think I used the last of my sun rations with 67018 the week before as, whilst the previous two trains passed in full sun, this did not. The next week is not looking promising either for photography due to my shift patterns. I've got a trip planned to Reading next Friday, but that is only to attend the excellent BEER FESTIVAL there, so I'm unsure when the next blog will appear. I will leave you with another in my series of Stupid Signs. 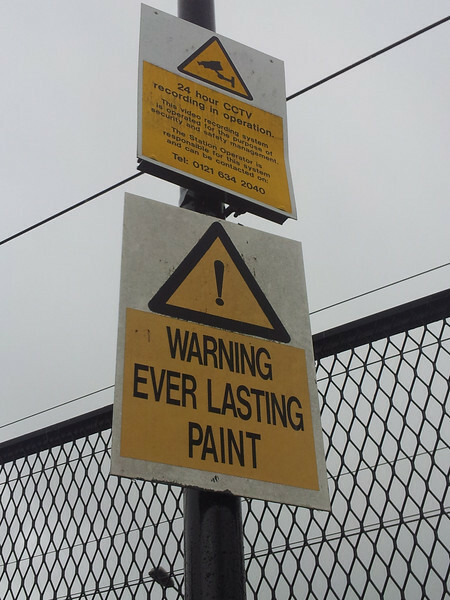 This one is from Erdington Station near Birmingham, and what you unfortunately can't see in the picture is that there is actually an area of paint missing just below the sign! Bye for now. 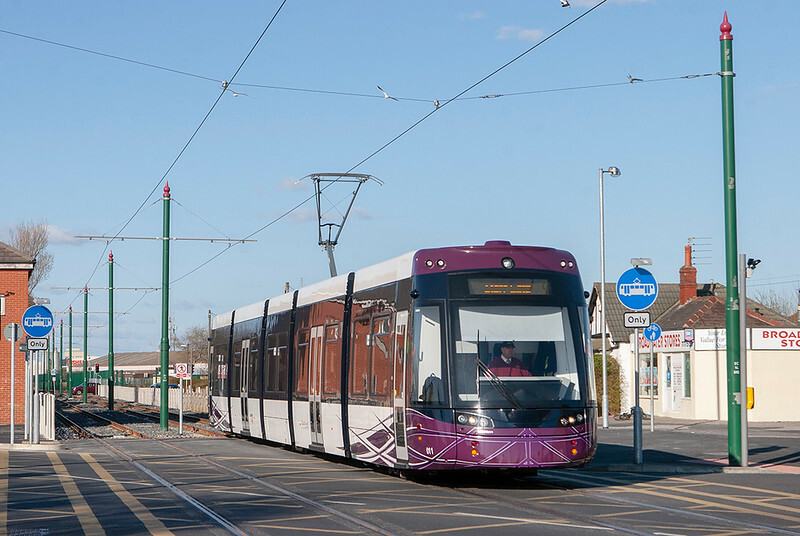 Hello and welcome to blog number 15 which, as regular readers will guess, is basically a 'Tram Special Edition' as the long awaited, £100 million, new look Blackpool Tramway opened this week﻿. Over the last month or three I've tried to document here the build up to this occasion, which at one point I wasn't sure would happen. To say Blackpool Council were leaving it to the last minute to get the final touches done is something of an understatement, in fact there's still plenty to do. Several stops still have stickers on saying they aren't in use (when they are), others still haven't been fully built (notably the terminus at Fleetwood Ferry), and yet more, all the ones on the ballasted track sections, are having to have metal plating fixed between the tracks on the behest of the Railway Inspectorate. Something to do with the risk of people falling under trams off the platforms. Anyway, the first tram with passengers ran on Tuesday 3rd April purely for invited guests and the Press. The following day marked the start of the full initial timetable with a tram every 20 minutes the whole length of the line. It has been such a long drawn out rebuilding that it was actually September 2009 when Fleetwood last actually witnessed trams in service! 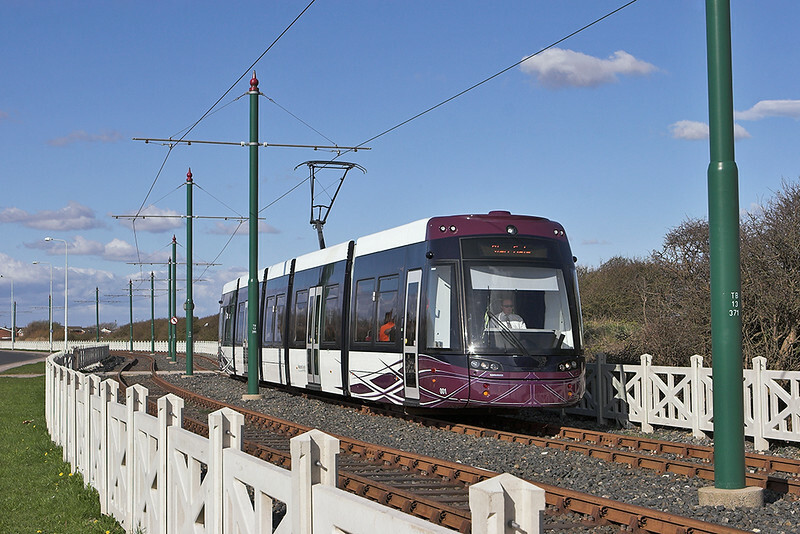 The first tram left Squires Gate, at the south end of the line, at 0500 on Wednesday with about 20 enthusiasts aboard. Not including me though; I wasn't going to get up at that time of day! 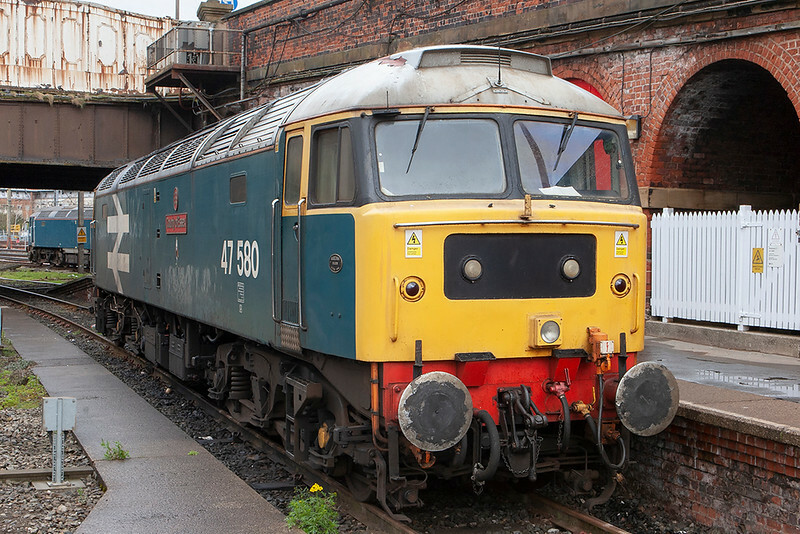 It departed Fleetwood Ferry at 0555 on the return journey and got 10 yards before derailing. 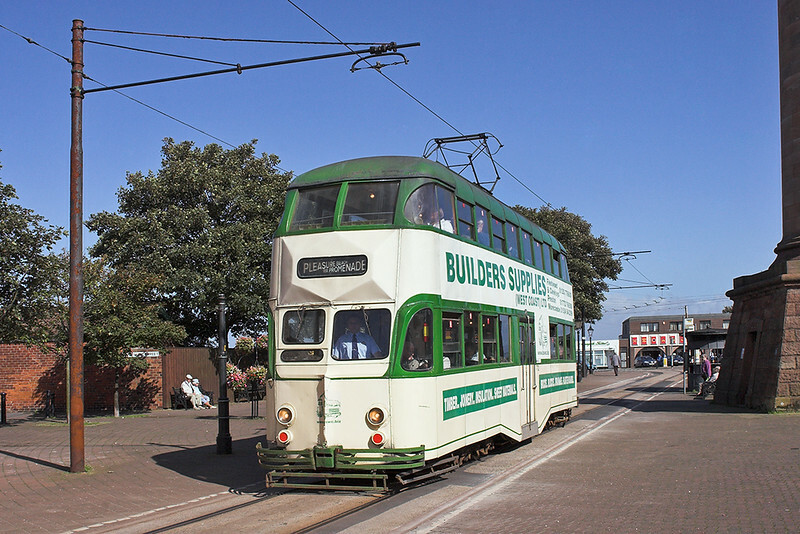 Due to the high winds over night sand had blown into the track and become packed solid, causing tram 006 to come off on the first corner as it departed the stop. After all the publicity the previous evening about the new service on local TV, needless to say this incident also made the headlines. I can vouch for the effects of the wind though as after just 20 minutes there my hair and ears were full of sand. My original plan was to go over to Blackpool on the Thursday to have a ride and take some pictures, however I pursuaded the wife to go for a visit to the Fleetwood Freeport Shopping Village on the Wednesday. The forecast wasn't fantastic; indeed some parts of the country were suffering from Blizzards, with a train getting stuck in a drift near Buxton; but the afternoon turned out lovely on the Fylde, despite the wind. As a result I managed a few shots in sun so didn't need to bother with a camera the next day and could just concentrate on riding and having a few beers. The 20 minute timetable had completely fallen apart with up to 40 minute gaps. This was mainly due to the sheer number of people trying out the new vehicles, I saw stops with 40-50 people waiting and many trams were completely full and standing. I also think the end to end times are somewhat over optimistic, especially as the top speed is currently limited to about 30mph. In addition of course the crews are still getting used to their new equipment. The last-minute nature of track repairs which has impacted on driver and conductor training has I think showed through. Having said that though, as I found out the following day, the trams themselves are superb to ride on. Yes, most are too full because of the limited start-up frequency over the Easter holiday; but when you travel on a reasonably loaded tram the ride and environment are outstanding. So, on the Thursday I went over, without my camera, on what turned out to be another gorgeous but cold day. I caught the 1040 from Squires Gate, which departed 16 minutes late and lost a further 16 minutes enroute. It was busy, but not too much so, and indeed once past Bispham didn't stop at many stops so the timetable definately needs looking at. 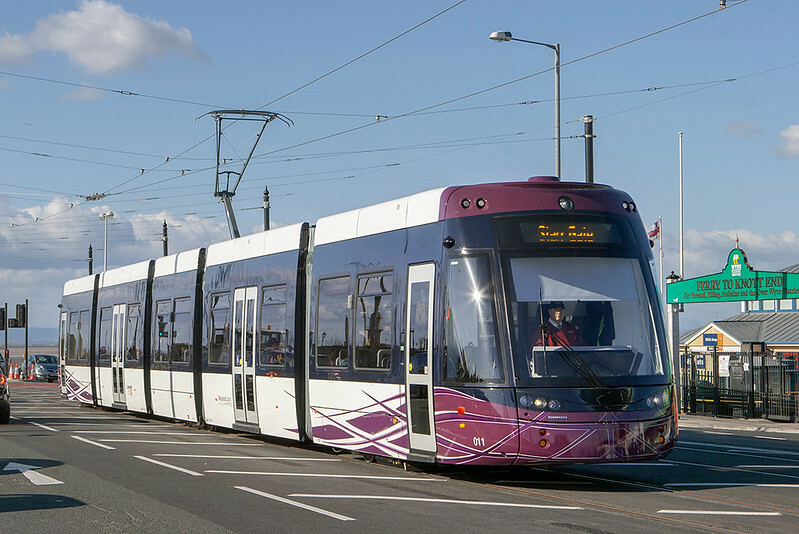 What doesn't help at the moment is the fact only one tram at a time can occupy the section between Fisherman's Walk and Fleetwood Ferry, as the newly built additional sub-station is not yet fully online. They are actually using a single-line 'token' which is kept in a locked case at Fisherman's Walk. This wouldn't be a problem if the 20 minute frequency ran correctly but with bunching, trams are often having to sit at the stop for quite some time to wait for the one in front to return from the terminus. Later on in the day, brand new set 012 was delivered to the Squires Gate depot. The unloading process caused even more delays to the service with at least a 30 minute gap in departures. Modified Balloon 724 was pressed into service: I saw it at Bispham heading for Fleetwood, hotly persued by a Flexity on a short working to Thornton Gate and another also heading to Fleetwood. 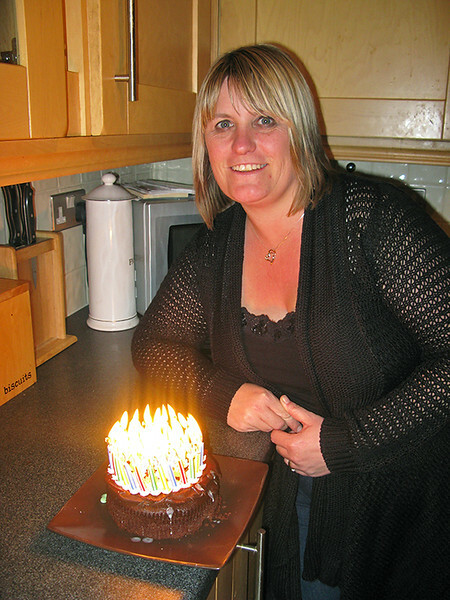 Apparently the Balloon broke down further out up the track, though I was in the pub by then! By evening the service was getting more back to schedule. Watching them go too and fro at Fisherman's Walk (from the interior of the Strawberry Gardens Public House), they seemed to be maintaining more or less the booked frequency, albeit leaving Fleetwood about 5 minutes late. Once they get a full 10 minute low-floor operated frequency in, and the crowds settle down to normal travel patterns, it should just require minor tweeks of the timetable to make the service reliable. Well, apologies to any readers who aren't tram enthusiasts, but I felt I should cover this 'event' in depth as I've been talking about it ever since I started this blog. I will get back over to Blackpool for some more pictures when the service has bedded in fully and the additional Balloon operated journeys, also the Heritage Tours, are up and running. All in all, teething troubles apart, it has the makings of a fantastic light rail system. 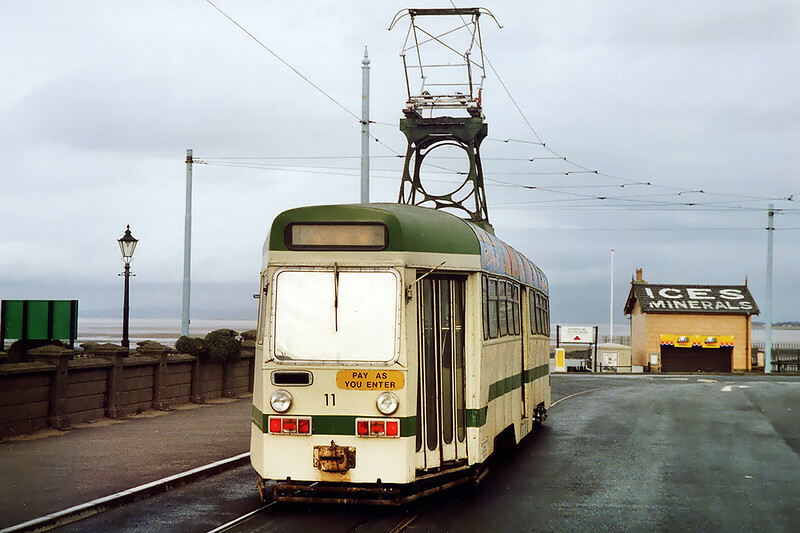 I'll leave you with (above) a shot from 20 years ago at the Fleetwood Ferry terminus of one of the original One Man Trams. Thanks for reading, hopefully 'normal' railways will feature next time! Hello and 'Bienvenue' to the lastest Railwaymedia Blog. With work and a fairly bad Head Cold, (or Hayfever or maybe even Man Flu?﻿), preventing me getting out and about, it was a whole week between my jaunts out with my camera: from the Scottish trip documented in Blog number 13 to last Friday's trip to the south. Shame given the fantastic weather we have been having! Needless to say, this week the forecast is now for cloud, rain and even snow. With it also being School Holidays not much time will be available this week either. But last Friday I did get out. With sunny weather forecast throughout the South I was torn between going to either Bath and Westbury or to Basingstoke and Reading. As I wasn't sure how the angle of the sun would be at this time of the year in th famous Sydney Gardens at Bath, I decided on the latter destination, hoping to get shots of the Prototype class 150s on the Basingstoke to Reading shuttles. Lovely weather greeted me all the way down on the 0533 Pendolino from Preston and the 0820 from London, which being a train to Exeter was a pair of 159s; it seemed strange leaving Waterloo on a diesel unit. On reaching Hook, a mere 5 and a half miles from Basingstoke, this March sunshine turned into thick murky mist, which stubbornly refused to clear all morning. I caught the bus from outside Basingstoke station to Kempshott, which is a 15 minute walk from Worting Junction. Having done shots at the footbridge overlooking the junction in the past, I decided to try for a shot at the Battledown flyover where the Up Line from Southampton to London crosses the Salisbury route. I had been warned there is a new fence and I might require stepladders to get a picture over it. I've yet to start lugging a pair of these round on my days out, I'd get funny looks in pubs if I did, so I went to the foot crossing nearer East Oakley which is located just where the Up and Down lines split. A strange set up it is too with just enough room between the two crossings to stand safely. I had about an hour there; the bad light meaning at least I was able to take photographs in both directions. With that I headed back to Basingstoke. With only 10 minutes to wait until the next sprinter on a Reading train was due to leave, I wandered up the end of the platform for a shot of a London bound unit. Fortune, and the sun, smiled as it appeared racing the Halewood car train. Then it was onto the prototype Sprinter 150001 for the trip north. 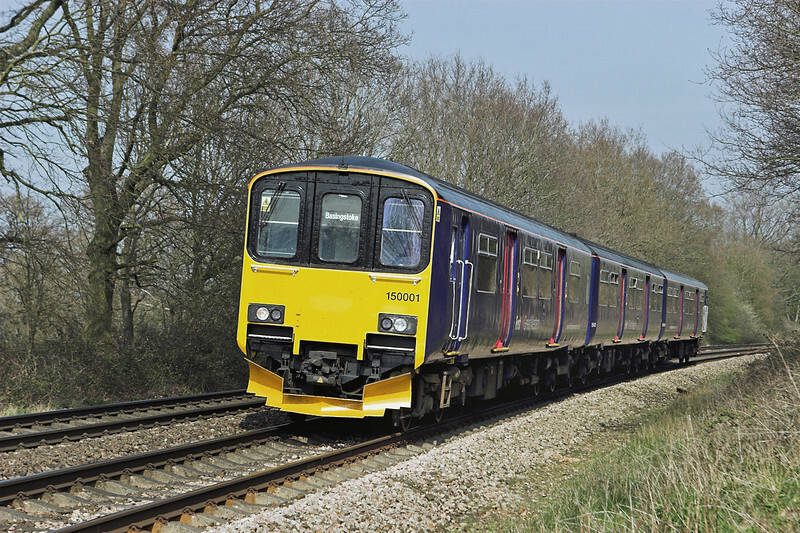 There is a half hourly stopping service on the route to Reading and I used this to visit the three intermediate stops: Bramley, Mortimer and Reading West. 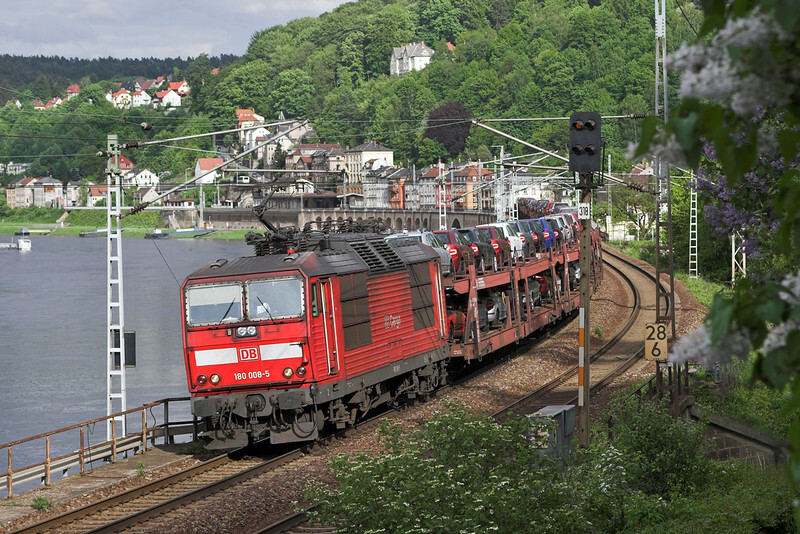 In addition to the local service there is also one or two Cross Country Voyagers every hour and quite often two freights each hour too. It's a line that is well worth a visit. Currently off peak the local service is formed of two units, one a 150 and the other a 165, but later the Turbo is used elsewhere so both the unique 3-car Sprinters are booked to provide the service. 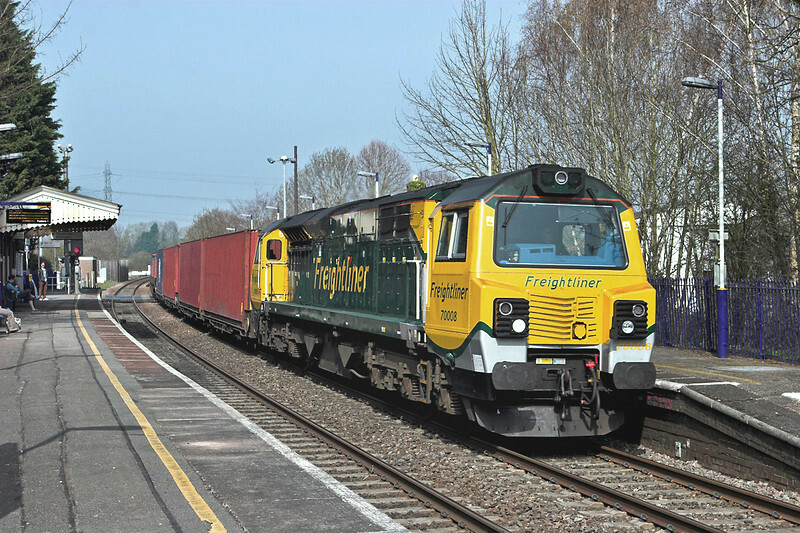 As mentioned, the freight service is quite intense with a good variety of types of trains. 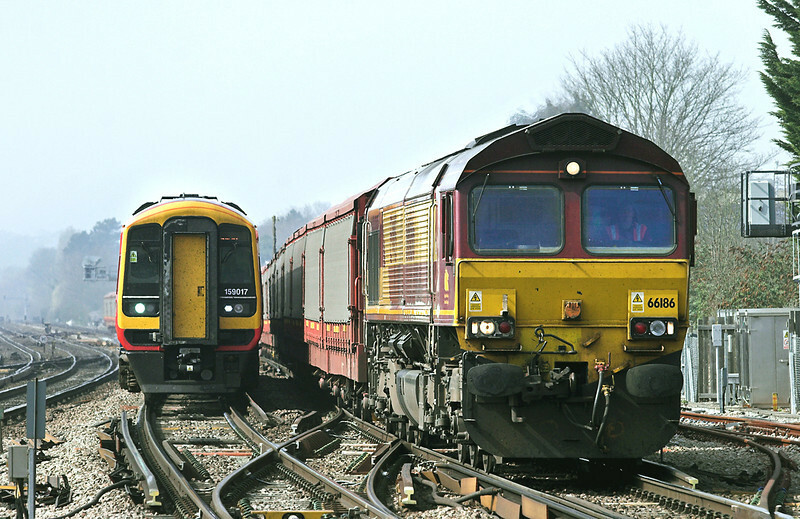 Whilst mainly trains carrying deep-sea boxes to the port at Southampton, there are also car trains and departmental workings, with increasingly Freightliner's class 70s being seen, as seen above at Bramley. Both Bramley and Mortimer are nice little stations, but the last stop before Reading, Reading West, is just an urban halt and far less pleasant. Indeed, I had heard of a story of a 'train spotter' being attacked here a few years ago so was quite wary of hanging about, though having said that it felt no worse than many stations I've been to. The main advantage of the location is you get all the traffic heading south to Basingstoke plus any stone traffic heading west towards Westbury. I pretty much called it a day after here and went for a few beers in Reading and Maidenhead. I was quite suprised to find Reading the much nicer town: I had expected it to be the other way round, though I didn't venture down to the Thames at Maidenhead so a quick visit might not be doing that town justice. A full collection of the photographs I took this day can be found on my site HERE. 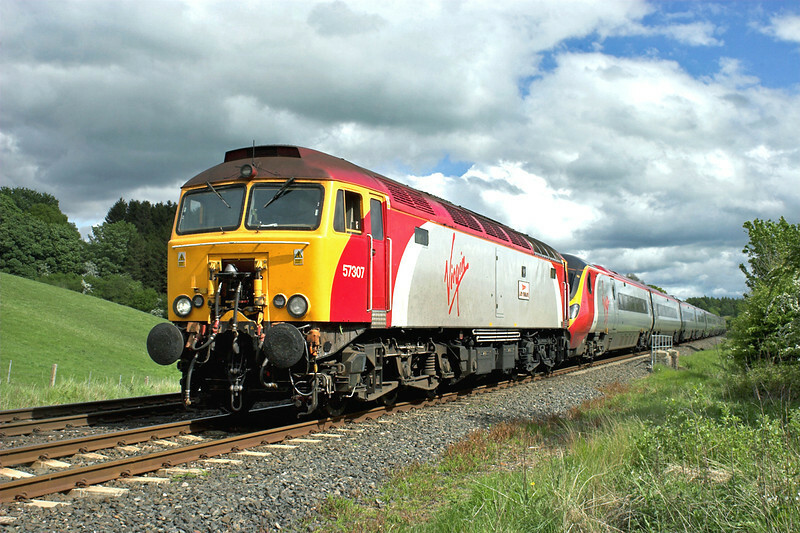 The next day, the Saturday, I was working and I hadn't realised I was booked on the one Virgin train of the week this year that is diverted over the Settle and Carlisle line. Normally I would look forward to this but, being the 1852 from Edinburgh so due off Carlisle at 2010, it was somewhat dark. Quite why this train is diverted I don't know as the London service 30 minutes earlier from Carlisle goes via the Main Line. Whilst for many years diversions this way have been a regular occurance, one Voyager a week is a far cry from a few years ago when during the 'divert season', most of Saturday and Sunday there was a train every 2 hours booked that way, many hauled by class 57s.